The early 19th century saw a proliferation in the production of printed material, including music. While a handful of London based publishers had been responsible for most of the dance publications of the late 18th century, the 1790s through 1810s saw many more music and dance publishers emerge. A popular Country Dancing tune of this era might be published in a dozen or more collections, with different dancing figures attached in each case. The link between tune and figures that may once have existed for printed dances had waned; dancers of the early 19th century were encouraged to invent fresh figure sequences each time they danced. The process of selecting the tune and figures to be danced was known as “calling” a dance, couples would take turns to “lead off” a country dance from the top of the set; the Master of the Ceremonies would liaise instructions between the calling couple and the leader of the band. It’s unclear at what date this convention emerged, but it was widely adopted by the start of the 19th century. British social dancing of the 1770s had been greatly influenced by France. The Allemande and Cotillion dances were introduced to England from the late 1760s, the French Cotillion proved particularly popular, especially amongst visitors to the spa town of Bath. The Cotillion was arranged in a square format for four couples to dance a sequence of choreographed figures. A new Cotillion dancing vocabulary was absorbed into English Country Dancing from around this date; figure names such as the “Allemande”, “Pousette” and “Promenade” became common in English dances of the mid to late 1770s. 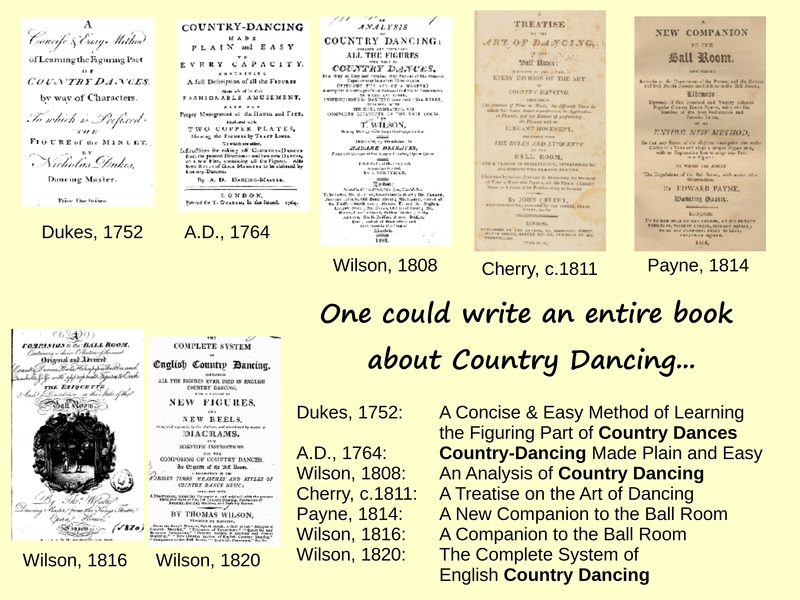 A renewed interest in steps and timing accompanied this shift, dancing masters of the 1810s wrote of the perfection of the “science” of country dancing as though it was a recent phenomenon. 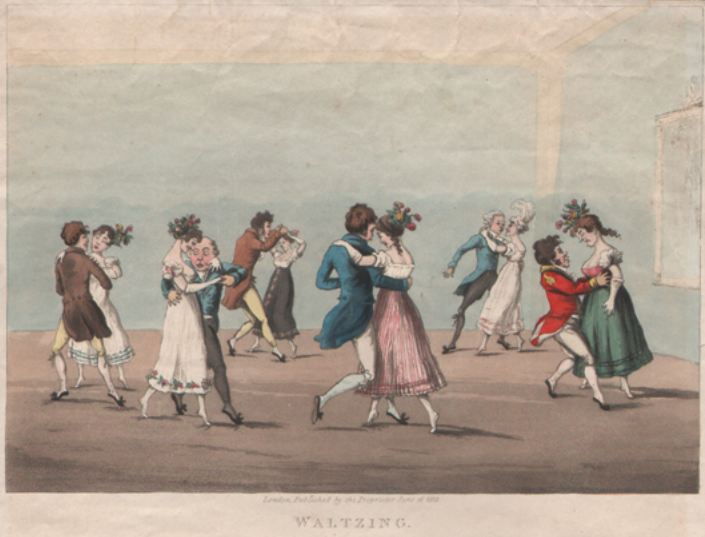 The 1790s saw the rise of the Reel as a dance form in London, and the 1800s saw the introduction of the Waltz, especially at the Royal party town of Brighton. 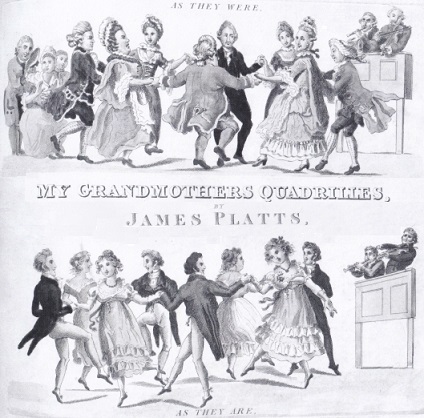 Image adapted from “My Grandmothers Quadrilles” by James Platts, 1820. An equivalent group of dancers perform a Cotillion in the 1770s, and a Quadrille in the 1810s. The Regency was a period of diverse dancing experiences. Strict etiquette rules were used to coordinate the dancing at the elite Assembly Rooms patronised by the rich, but riotous dancing parties might be enjoyed by a different class of dancer at a Tavern next door. Controversial dances such as the Waltz might be danced in a very different style at one such venue compared to the other. Cotillion dancing fell out of fashion in the early 19th century, but returned in the form of the Quadrille from the mid 1810s. The Quadrille was typically danced by four couples to a memorised sequence of figures; a great variety of choreographed routines were published from the late 1810s, but only a few major sequences survived beyond the mid 1820s: namely the First Set, the Lancers and the Caledonians. Technology continued to advance. Musical instruments with an ever more diverse range became available, most notably in the form of the Piano Forte. Popular operatic and stage music was routinely adapted into dancing tunes; private quadrille parties at family homes became an increasingly popular pastime, perhaps to the accompaniment of a relative playing on the family piano. The proliferation of surviving printed material ensures that far more is known about this period of social dance history than is true of any preceding generation. The cost of publishing had decreased sufficiently that vanity publishing became possible. A Regency era dancing master named Thomas Wilson is of particular importance today. He published a vast range of books on dancing and is personally responsible for much of what is known of this period. 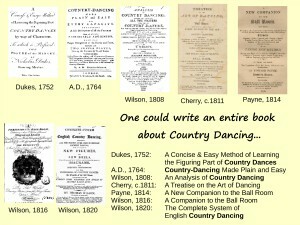 He was not the only dancing master of his generation to publish books on dancing however, other dancing-master authors of the 1810s included Edward Payne, G.M.S. Chivers, and John Cherry. This diversity of source material offers a welcome and nuanced insight into the social dancing trends of the period. 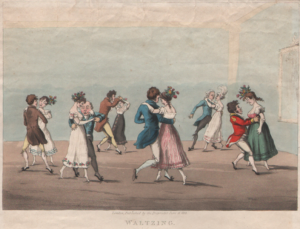 English Country Dancing fell out of favour with Britain’s elite social dancers towards the end of the 1810s, it was the Waltz and the Quadrille that became the preferred dances into the 1820s and beyond. A medley of minor dance formats were also invented and promoted, including Waltz Country Dances, Circular dances (Sicillian, Chivonian, etc. ), Sixdrilles, and the like. The next major dancing trend to sweep the British ballrooms arrived from around the year 1830 in the form of the Gallopade and Mazurka dances; the Polka then arrived in the 1840s, a dance closely associated with the reign of Queen Victoria. Animated dances and research papers covering Regency era dancing. E. Aldrich, From the Ballroom to Hell (Evanston, IL, 1991). T. Buckland, Society Dancing: Fashionable Bodies in England, 1890-1920 (Palgrave Macmillan, 2011). P. Dixon, Nonsuch: Early Dance. Glossary of 18th & 19th Century Dance Terms (Nonsuch Productions, 1993). Dolmetsch Historical Dance Society, The First Refinement: Early 19th Century Dance (Summer School booklet, 1997). English Folk Dance and Song Society, Dolmetsch Historical Dance Society and the Grand Union of Folk Dancers, Understanding Victorian Society through Dance: from monarch to mudlark. A teaching resource for Key Stage 2 and above (teaching pack with booklet and CD, Salisbury, 2000). J. M. Guilchen, La Contredanse (La Haye, 1969). P. Richardson, The Social Dances of the 19th Century (London, 1960). E. A. Rogers, ‘Resources for the Study of 19th century Social Dance’, Historical Dance, vol. 3, no 5 (1998). F. A. Zorn, Grammar of the Art of Dancing (English version, New York, 1905).